Categorized as: Stories on March 8, 2011. A story by Suzanne Skees on literacy education in Mexico. 28-year-old Luiz Fernando Mendez Ruiz grew up in Chiapas, and he knows firsthand the issues his microfinance clients face—some of Mexico’s highest rates of poverty, malnutrition, and illiteracy. He used to work as a hospital emergency nurse and then switched to teaching classes for our local microfinance partner, Al Sol. Luis felt a strong conviction that he could save more lives this way. Luis teaches classes to small credit groups when they gather to repay their microloans, through Freedom from Hunger’s Credit with Education program. Slowly he teaches letters, words, and numbers that can help students advance their businesses, health, and self esteem. Initially, the women tried to treat Luis with the same deference as they did the other men in their community. Lessons lasted barely half an hour, and no one spoke up. 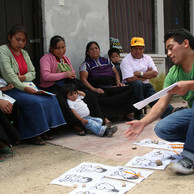 Luis persevered, leading sessions on self-confidence and gender issues. Gradually his clients asked, “Why do you treat us this way?” And then they commented that they liked it. Luis brings health topics, e.g., “Facing Illnesses that Attack Our Children,” into his literacy training, to identify common illnesses such as diarrhea, respiratory, eye and skin irritations from smoke. Because Luis’s family lineage comes from the Chamulan tribe, Luis speaks and teaches in local dialect Tzotzil as well as Spanish. He teaches adult reading and writing and blended modern and traditional medicine. Linking native medicine to modern treatments, he shows which ailments can be treated at home and how to advocate with the local doctor for more advanced illnesses. His students become more vocal as they become literate. Julia used to run out of credit meetings early because she had to get home and cook dinner for her husband. Now she leaves his dinner on the table for him. “It’s important for me to go and learn to read and write,” she tells him. Wives complain to their husbands about overuse of alcohol. “You’re going to die early,” they warn. And mothers ask their children to eat a piece of fruit before enjoying a treat of candy. These changes may seem small, but to Luis, they add up to an enormous social shift toward equality, health, and happiness. To him, literacy holds the key to it all.